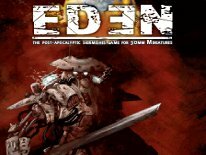 This is a game I've had my eye on ever since I saw the first images of the miniatures. I'm a sucker for most any game with miniatures, especially board games. Dust Tactics is being done by the same people responsible for The Adventurers, which is Dust Games and AEG (which we reviewed a few weeks back). The subject matter is so popular, that Image Comics previously published a comic book called Dust as well, and an all new 3-part mini-series called Dust Wars is slated for release this month. Actually there are 1:35 scale models, and 1:6th scale action figures available based on Dust too. It's a popular IP for sure, and Paolo Parente is responsible for creating the universe in which all of these products exist within. 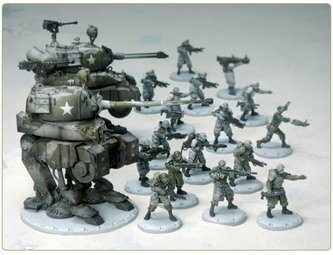 Fantasy Flight Games released a strategy board game before called Dust, but this will be the first miniatures game utilizing the property. What makes Dust Tactics interesting is that it's another “What If” game, depicting an alternate WWII-ish universe, utilizing mecha as well. 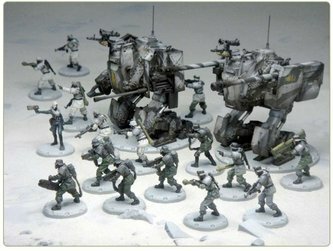 The game will be set in 30mm scale, and will come with 30 soldiers, 4 mechs, 2 heroes, a modular board, dice and some obstacles. The regular set will come with unpainted miniatures, but they're base-coated green and gray to distinguish which side is which, and they claim the base-coast they provide is perfect for painting enthusiasts to paint them as well. The deluxe set will come with fully pre-painted miniatures, and if these are anything like the pre-painted minis from The Adventurers, they should be quite impressive. I've provided some images to give you an idea of how cool they will look. There's already three expansion packs in the works, one is called Artillery Strike set for November 2010, the other Blutkreuz Attack (I won't even begin to try and decipher what that means) set for a January 2011 release, and May 2011 brings the Battle of Britain expansion. They even claim that by the time Gen Con 2011 is here, they'll be ready to take the battle to the Desert next. At present Dust Tactics is set for an early release in August only at Gen Con, with the general release set for September 2010. I'm set to review it once available, so keep watching WarGameGuru for more on Dust Tactics. 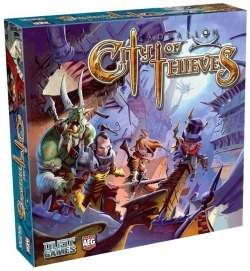 Another collaboration of AEG and Dust Games is City of Thieves. This is a card/board game with miniatures that utilizes guilds of thieves, competing to control the underworld. I don't know a lot about the game yet, other than it's being done by the same guys responsible for The Adventurers and Dust Tactics, and they're continuing the trend of releasing the game with very nice unpainted miniatures, and offering amazing pre-painted versions of the same minis in deluxe sets, or as an optional expansion pack like they did with The Adventuers. 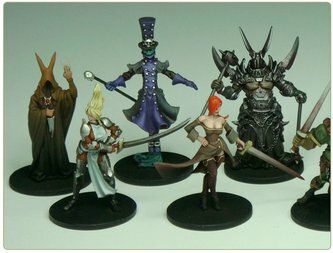 I've included the latest images of the box, and the pre-painted minis from the game. AEG announced today that City of Thieves will be on sale the first day of Gen Con at their booth, and they'll be running games of it throughout the duration of the convention. 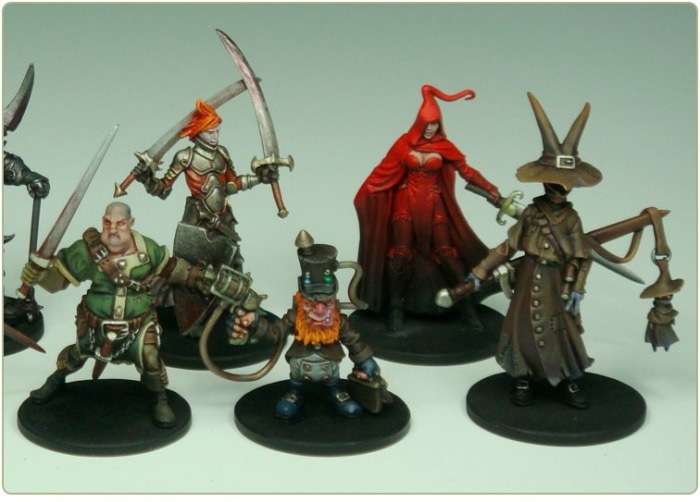 For more on both City of Thieves and Dust Tactics keep an eye on WarGameGuru.